I've just had a lovely week's holiday in Australia. It was beautiful...the only negative was that I couldn't take my scrapbooking stuff with me! So, just back and I had all the week's blogs to check over and still a couple of days before school goes back. The sketch at CAS Colours and Sketches brought an idea to mind straight away. 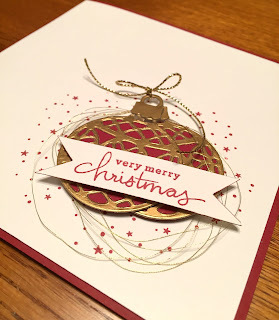 The ornaments die and stamp set I got from the holiday catalogue is endlessly versatile and I'm glad I got it. 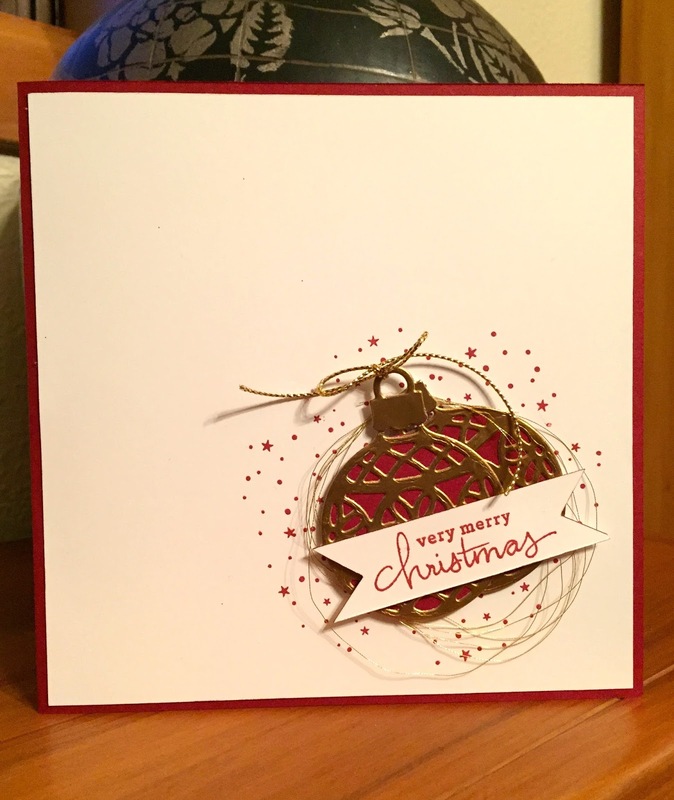 Update: So pleased that this card was chosen as a weekly winner at CAS Colours and Sketches. Other: Delicate Ornaments die, Gold thread, Gold cord trim, dimensionals, Cherry Cobbler marker. 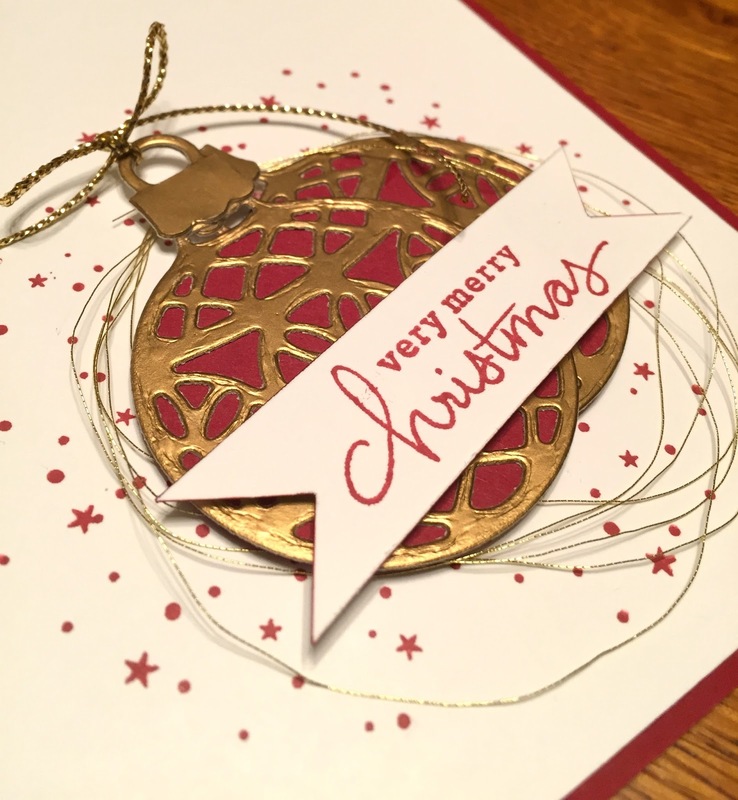 Super idea to turn the labels into Christmas baubles. Thanks for playing at CC&S. So glad you had a wonderful time and hope you had lots of sunny weather!! 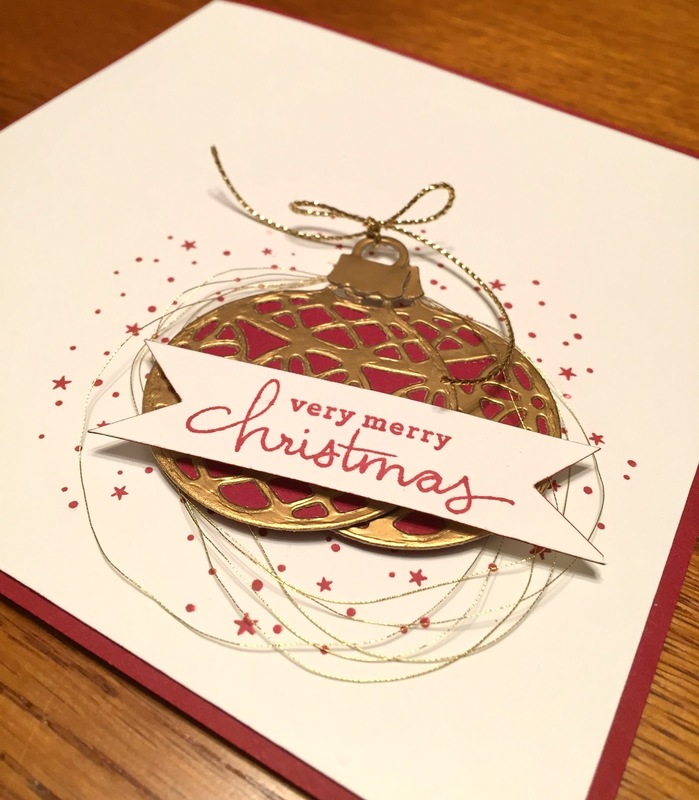 Beautiful card and love that colour with the gold. Really like those tiny stars etc behind the baubles...are they stamps or a stencil? And I really must use cotton on my cards more often, looks so good on your card! Yes, fantastic time - been spoilt with two holidays this year: Hawaii and Australia! The tiny star are stamps from an SU set called Holly Jolly Greetings. That metallic thread was devilish to use - so fine and fly away. Glad you like the card. I really love this card - brilliant take on the sketch. A fabulous interpretation of the challenge sketch Jan. I often struggle with metallic thread also, but your effort was worth while. Love that die set, also. It is nice to have tools that don't include snow, robins, snowmen et al...your colour scheme is perfect for a southern hemisphere Christmas. Well done.